Bognor held their annual meeting, attended by well over 100 people. Board chairman Stanley Riseborough presided over the meeting. Special mention was made to the excellent news that over the past few years more than 100 new members have joined the club. Outgoing 2017 club captain Norman Lee gave his report and mentioned the club’s 125th anniversary held last July, which was a tremendous success. Thanks were given for the tremendous work done on the course by head greenkeeper and his staff, and to George Mitchell, bar and kitchen manager, and his staff, who has had a hugely successful first year at the club. Lee welcomed 2018 captain Rob Holland and wished him well for the year. Holland introduced Sean Maginnis as his vice-captain for the year and said the club had been given the honour of holding the Sussex amateur championship in July. The captain’s drive-in took place the following morning. Holland was at the club at 7:30am to meet and greet the 150 members who all had a hearty breakfast before the drive-in. Holland is known for his flashy golf clothes and he was paraded on to the first tee by friends who turned out in some weird and very bright outfits. He was presented with his captain’s jumper by club pro Matt Kirby before hitting his drive down the first. It went 213 yards and raised some money for his charity. The four-ball better-ball Stableford competition followed the drive-in with a magnificent 132 entrants. Nearest-the-pin winners were Tim Jacob, Roland Heath, Sean Francis and James Maclean. Ladies’ winners were Elaine Connisbbe and Andrea Cooper with 44 points. 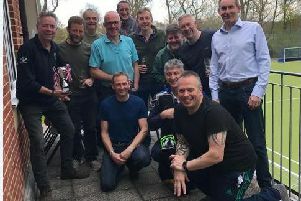 The men’s winners were Andy Field and Andy Wallhead with 45, ahead of Kevin Holland and Alan Simmonds on 41 – they beat Rob Redmond and Andy Wiggins on countback. * The weather tried everything in its power to stop the Easter medal being played. It was postponed at Easter because of rain, then on the rearranged date thick fog caused a two-hour delay. Club manager James McLean thanked all those playing in the event for their patience. Ryan Maskell won the Easter medal with nett 67; great scoring in tough conditions. Richard Doherty came second with 68; Jeff Clark, Andrew Field and Andy Wiggins all had 69. * Bognor seniors played their first match of the season at the tough Dyke course but were whitewashed 8-0. The only notable performers were David Turner and Mike Oates who came back from four down at the turn and lost only on the 18th. A few days later the seniors hosted Cowdray Park. It was a gorgeous day with temperatures in the high teens and the course seems to have overcome the burden of a poor winter. The match went Bognor’s way 5½-2½, a major relief following the disaster at The Dyke. The return at Cowdray is in June. Results: Mike Oates & Sean Francis won 3&2 over Phil Harrison & Colin Tebbutt, David Turner & Richard Riseborough lost 1 down to David Fowler & Dave Wickham, Steve King & Ian Paine won 4&3 over John Durrell & Mike Hughes, JJ Stephenson & Mike Matthews won 4&3 over Brian Carpenter & Allan Gormley, John Owen & Richard Hedge halved with Alan Bradley & Brian Brockhurst, Phil Conisbee & Barry Ingate halve with Mark Kelly & Richard Burden, Mike Wadley & Alan Fitzgerald won 2up over Mike King & Graham Thompson, Clive Millett Oscar Wild halved with Trevor Edwards & Pat Harrison. Chichester and Goodwood veterans played for the Jim Robertson Jug. It’s played on a home and away basis, and although Chichester won the first year, Goodwood have won in the past two years. This year on the Downs course it was a hotly-contested, with all the four-ball matches being very close. In ended 3-3 to set up the return at Chichester’s Cathedral course in September. Results: (Goodwood names first): Jim Plunkett/Brad Austin bt Mike Skinner/Jim Robertson 2&1; Warwick Davis/Roger Hoad bt Chris Penny/George Bell 1up; Vernon D’Costa/Jim Glover lost Norman Moore/Ken Jackson 2&1; Nigel Tibbitt/David Morgan lost Phil Mitchell/Bruce Santer 1 down; John Dixon/Andrew Smith bt Mike Hunter/Bill Martin 2&1; Trevor Till/John Donaldson lost Nigel Wood/Bryan Morgan 3&2. The J & J Trophy, which is a drawn pairs, was a two-day competition for Cowdray Park’s men’s section. Steve Lucking and Ben Shotter won with a fantastic score of 128 (-10). Second were Adrian Poole and Nick Beaumont with a total of 130. Third were Kevin White and Lewis Chapman, also on 130.